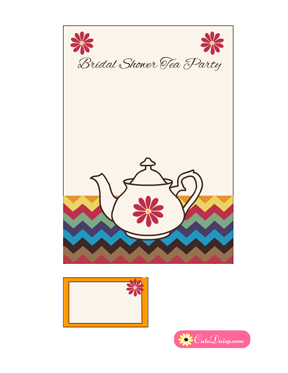 Today I have made these three adorable Free Printable Bridal Shower Tea Party Invitation Templates in different colors. 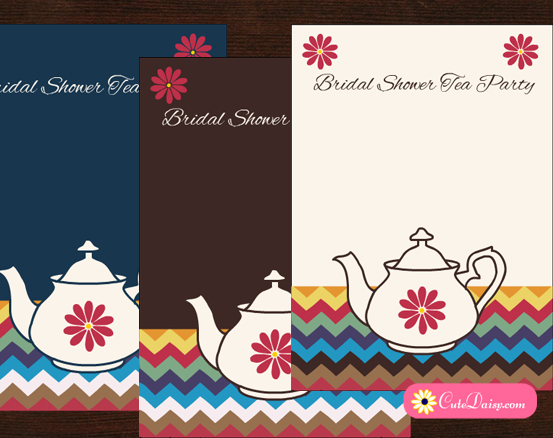 You can use these invitations to invite your guests to the bridal shower tea party. These PDF templates are editable hence really easy to personalize and customize. 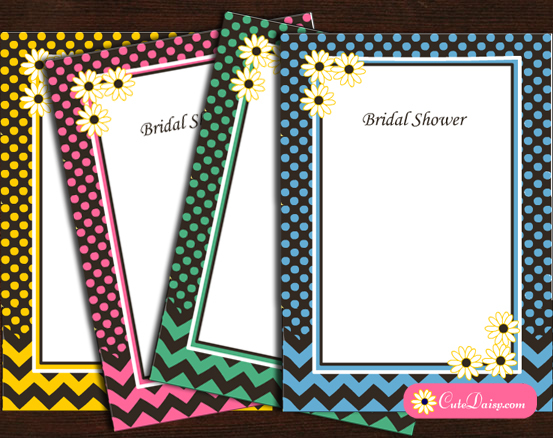 You can add your own name of the bride, hostess, party location, time and RSVP info in these invitations. These invitations are for personal use only. I have also made a matching address label with each template that you can paste on the envelope and write the name and address of your bridal shower party guests on it. You can add text to the text fields in PDF file just once and then can print as many copies as you desire according to the number of your bridal shower party guests. All the graphics used in these invitations are original and created by me so please do not steal my work or misuse it. 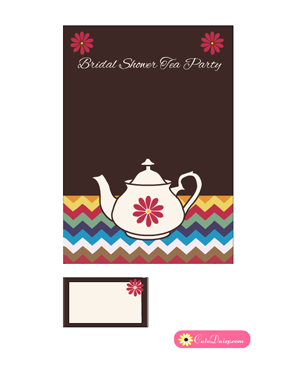 Click here to download this adorable free printable bridal shower tea party invitation template in blue color. I have made a colorful chevron pattern in the base and a super cute tea pot in the center. If you’ll fill in the text fields the text would be written in white color and that will stand out against the dark background. 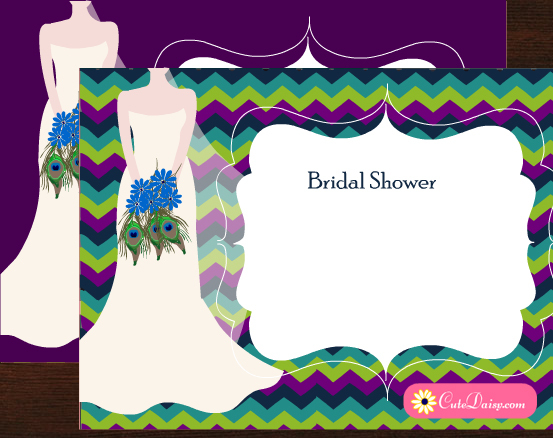 Here is another color variation of this beautiful bridal shower invitation. Click here to download the editable and easy to personalise PDF file for this invitation. 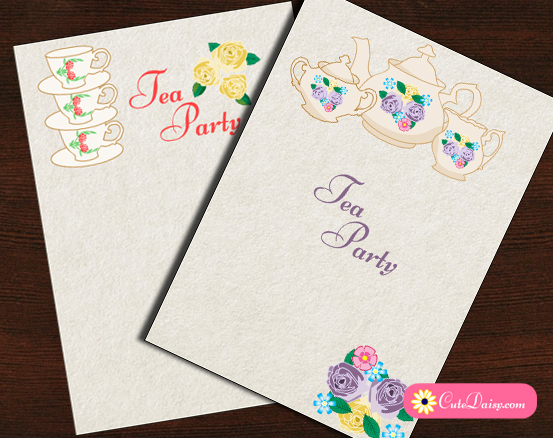 This is my most favorite color among all the tea party invitations that I have made today. When you will fill in the text fields, text will be written on this invitation in brown color. Click here to download the editable version of these invitations. Please do not forget to like this post, leave a comment below and share this on Facebook, Pinterest and other social media.